For continued and long term success in trading it is important to understand the conditions that best suit your strategy and then look to only implement your strategy in the most favourable market conditions. With this logic in mind it is also beneficial to develop more than one core strategy, a strategy that performs better in the conditions seen as unfavourable for the first strategy. Adopting this approach allows you to diversify your efforts and ensure that you are mainly operating strategies suitable for the conditions present during each trading period, which depending on your time frame may be a day or a month. When markets are trending and prone to sustained directional moves in price, it is best to employ breakout methods or to look to catch retracements in price which offer the opportunity to join a resumption of the trend, however, during range-bound periods of consolidation mean reversion tactics work best whereby you look to catch price as it moves out to extremes, targeting a reversion to the mean. One of the best tools for trading a mean reversion strategy is VWAP. Typically we can use VWAP a lot like a moving average whereby we look to trend in the direction of price relative to the average e.g bullish when price is above and bearish when price is below. Once the market moves into consolidation and VWAP flattens out, it can be used to highlight really powerful support and resistance areas by tracking price against the standard deviations of VWAP. These levels offer really reversal opportunity as price becomes over extended from its VWAP and trades back into it. 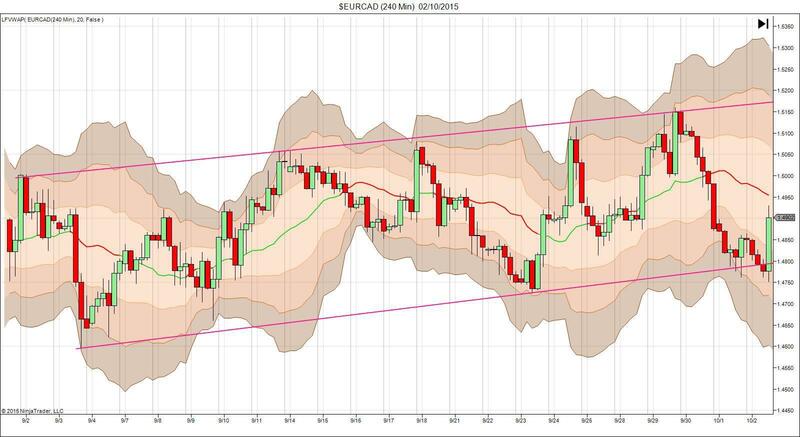 The chart above shows NZDUSD 15min in a typical range-bound market. You can see VWAP is flat (indicating range trading) and price is simply rotating between the negative standard deviations as support and the positive standard deviations as resistance. VWAP alone gives us the areas we are looking to trade and we can trade the levels effectively just using basic price action but if we want to be more conservative with our approach we can looki to use an added filter to confirm our trades. Delta (Book pressure) is a highly sophisticated indicator that measures the net difference between buying and selling strength in the market and also the difference between the volume traded at the bid price and volume traded at the ask price. Delta is brilliant for illuminating the strength of order flow in the market and can be used alongside VWAP to identify when order flow looks set to reverse as the indicator begins to diverge from price. Where we can identify Delta divergence at the outer standard deviations of VWAP we know we have a high probability mean-reversion setup. If we focus solely on the 3rd standard deviation only, the probability becomes even more favourable. 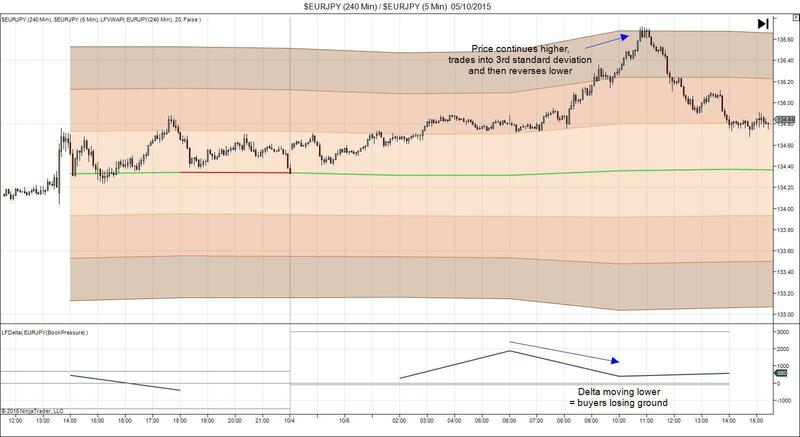 In the chart above we have the EURJPY 4hour VWAP overlaid onto 5-minute price action. The 5 minute price action allows us to see the most initial reaction that price displays when it tests the H4 VWAP offering fantastic scalping opportunities. Delta is most powerful on an intra-day basis where it is highly sensitive to order flow, however, when used on higher time-frames ,although less sensitive it still gives fantastic insight into the general order flow make-up of the session. We can see that price is trading in firmly range-bound conditions with VWAP flat. As price begins to travel higher from VWAP we can see that Delta is trending upward highlighting the strength of buyers in the market. Notice however that by the time we reach the second standard deviation, Delta has started to diverge with price, indicating weakening demand. By the time price has pushed up into the third standard deviation (our potential trade zone) we can see that Delta is showing strong bearish divergence and we can see that price stalls out at the third standard deviation level, where we can initiate shorts looking for price to rebound to the second standard deviation as an initial target and a return to VWAP as a final target. As you can see, price sold off from the reversal at the the third standard deviation and hit the initial target at which point we could move stops to break-even. Price then continued to sell off and eventually made our final target at a retest of VWAP. These extensions of price into the outer standard deviations of VWAP during range-bound conditions, using Delta to highlight divergence, are fantastic mean-reversion setups that you should definitely look to build into your strategy portfolio. 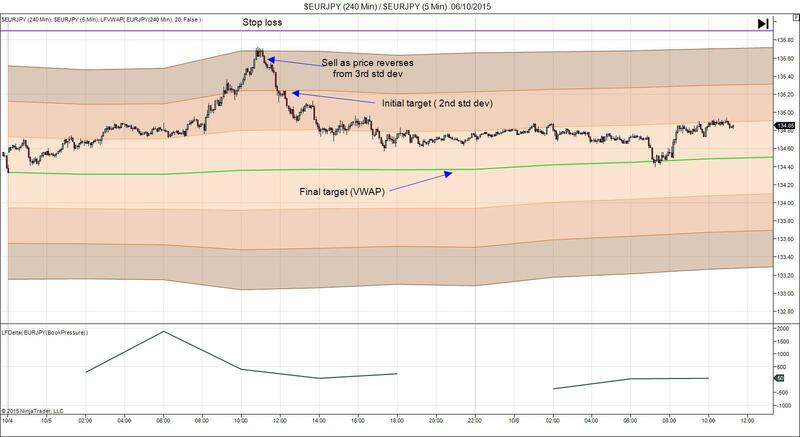 In the EURJPY example above, the range is very easy to spot because VWAP is totally flat. However, once you get good at identifying range-bound conditions you can begin to use VWAP in more advanced ranges such as channels and wedges. 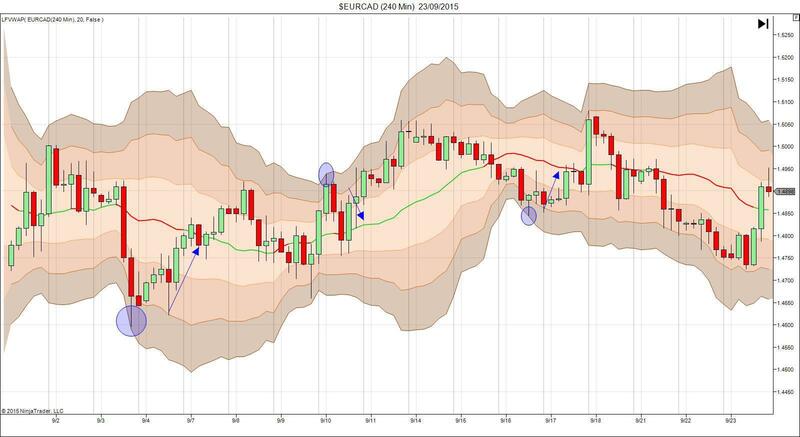 The chart above shows EURCAD on the 4 Hour charts and we can see that price is stuck within pretty confined consolidation. Although VWAP is not totally flat it does remain fairly direction-less showing only a very slight curve in either direction as price rotates between the initial high and low points of the range. 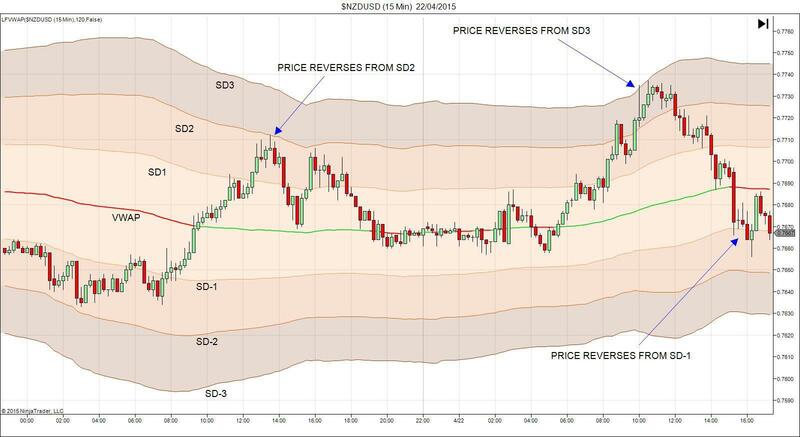 Notably, each of the three occasions that price moved out into the 3rd standard deviation of VWAP we saw price sharply retreat back into VWAP with between 100 – 300 pips worth of movement, highlighting the potential profit to be made from fading these moves. The chart above shows that price is simply rotating within a very clear channel formation and whilst the channel holds, we can continue to use VWAP to fade moves into the outer standard deviation levels to play for a reversal back to VWAP. Once price breaks out of this channel and VWAP starts to follow a steeper curve (indicating a strong directional move) we know that the market is likely moving into an expansion phase (a trending period) and we then cease looking to fade these moves and change tactics to looking to sell a retest of VWAP as price retraces, to join the bearish trend. All comments, charts and analysis on this website are purely provided to demonstrate our own personal thoughts and views of the market and should in no way be treated as recommendations or advice. Please do not trade based solely on any information provided within this site, always do your own analysis.